Abies hidalgensis, original herbarium sample at RBG Edinburgh. Abies hidalgensis first described by Zsolt Debreczy, István Rácz and Enríque Guízar Nolazco in 1995 is commonly known as Hidalgo fir or Abete de Hidalgo in the Spanish language. The epithet refers to the Mexican state of Hidalgo, where the species was first collected. The name also recalls Miquel Hidalgo y Costilla (1762 - 1811), a prominent personality in the post-Columbian Mexican independence movement. It is closely related to Abies hickelii and considered by some authorities to be an isolated population of this species. The original paper compares it to Abies guatemalensis and Abies religiosa. Further work on the taxonomy of this group (whose needles have a high number of resin-canals) and other geographically nearby species is probably needed. Description. Hidalgo fir is an evergreen coniferous species of tree. Height and diameter metrics were not recorded in the initial study. It typically grows with a single straight trunk and conical to columnar crown. Branches are spreading and ascending, higher orders descending in lower part of the tree. Bark is smooth, light gray, becoming thick with age, fissuring into irregular large plates, with a scarlet inner bark. Twigs are robust, smooth with a dense yellowish-brown pubescence. Leaves are shiny dark- or dull gray-green; shade foliage is soft and flexible; sun foliage is thick and succulent, pectinately arranged, abruptly shortened to 0.4 inch (1 cm) on the upper sides of twigs, linear, curved slightly downward or forward, 1.2 to 2 inches (3 - 5 cm) long by 0.06 inch (1.5 mm) thick with an emarginate apex and sparse stomata, mostly toward apex on upper side, appearing in two broad white bands separated by a green midrib on lower side with 2 to 5 (exceptionally to 7) medial resin canals. Pollen cones appear on lateral branchlets, growing 0.4 to 0.47 inch (10 - 12 mm) long on a 0.12 inch (3 mm) peduncle. Seed cones also grow on lateral brachlets; they are erect on 0.16 to 0.4 inch (4 - 10 mm) peduncles, cylindrical in shape, 2.6 to 3.2 inches (6.5 - 8 cm) long, 1.4 to 1.6 inches (3.5 - 4 cm) wide, green at maturity, with an obtusely rounded or slightly impressed apex. Seeds are narrowly triangular (size not given) with resin blisters and narrow, light yellowish gray wings (not fully developed at the time of the description). Distribution. This species is native to Mexico — the state of Hidalgo. It was found in the cloud forests of Sierra Madre Oriental, in a deep canyon running eastward, 3 miles above the small village of Metepec at an elevation of 7,500 feet (2,350 m) above sea level. As part of the research done in the region, Dr. Enríque Guízar Nolazco proposed that the entire canyon be declared a conservation area. 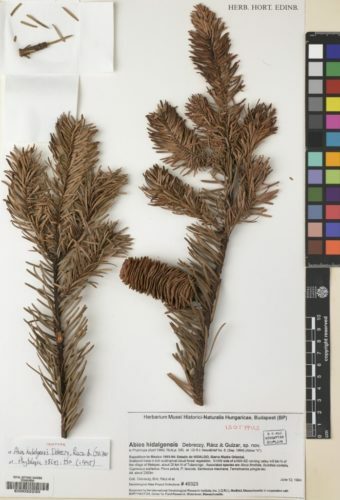 Abies hidalgensis — original herbarium specimen at Royal Botanical Garden, Edinburgh, UK.